The Disaster Artist is a biopic, a bromance, a comedy, and ultimately, a success story. Ostensibly, the movie is the story about the making of The Room, a movie considered by some to be “the best bad movie ever made.” Directed by and starring James Franco, it goes deeper to explore the relationship between the The Room’s mastermind, Tommy Wiseau, and his best friend Greg Sestero. It ponders what drives people to create art, and what happens when it seems like no one else gets it. Portraying Greg is Dave Franco, James Franco’s brother. It’s their first time onscreen together, and the pair have the right brotherly chemistry to portray Tommy and Greg. No doubt drawing from their own triumphs and conflicts, Dave Franco proves to be an engaging foil to his brother. He’s also a gifted performer in his own right, giving Greg great emotional depth. Rounding out the cast are a number of accomplished actors, which include Franco’s longtime collaborator Seth Rogan. Along with him are Ari Graynor, Alison Brie, Jackie Weaver, Paul Scheer, Zac Effron, and Josh Hutcherson. The humorous chemistry of the cast is readily apparent, and the cameos scattered through, including a scene with Bryan Cranston playing himself, show the strength and diversity of the cast. 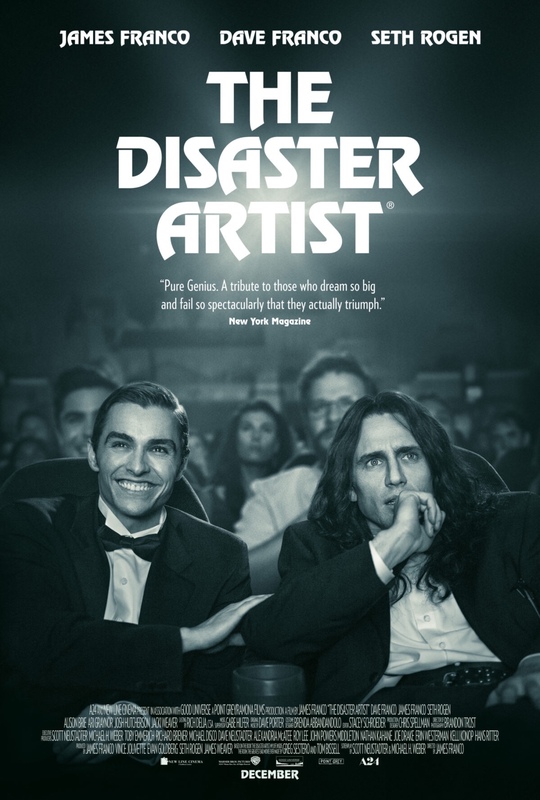 The Disaster Artist is based on the behind-the-scenes book written by Sestero. As such, it casts everyone in a sympathetic light. Despite his many, many odd choices, you find yourself rooting for Tommy as he’s making his masterpiece. The movie doesn’t answer the more personal questions about Tommy, nor does it feel it has to. This is a love story, not an expose, and Franco would rather celebrate Tommy’s passion than pick at it. The film, too, is more of a comedy than a drama. While based on actual events, Franco embraces the ridiculousness of it all and injects the film with a lot of humor. Thankfully, none of it feels forced, as he prefers to let the characters and situations bring out the laughs organically. This also allows the film’s few serious moments to land. Franco is clearly a fan of Wiseau and The Room. His attention to detail flows through all elements of the movie, from his spot-on performance to the many shot-for-shot recreations of scenes from The Room. Ironically, Franco spent far more time and effort recreating those scenes than were likely spent on them originally. Fans will no doubt be thrilled to see some of their favorite moments recreated for this movie. Whether you are a diehard fan of The Room who attends midnight showings, or have no idea what this cult classic is about, you will enjoy this honest, sometimes hilarious tale about how one of the worst movies ever made became beloved by so many. In the end, The Disaster Artist proves that art is in the eye of the beholder, and that a terrible movie can’t be that bad if so many people enjoy it. Next “Bomb City” Trailer Drops Today!